In addition to its unusual behavior at low temperatures, water has another interesting property. At a certain temperature and pressure, it can exist simultaneously, and in perfect equilibrium, in a solid, liquid, and gaseous (water vapor) state. This equilibrium form is called the triple point of water, and is quite useful in helping to define and measure temperature. To recall, the zeroth law of thermodynamics states that two bodies in thermal equilibrium with a third are in thermal equilibrium with each other. In other words, two bodies in thermal equilibrium have the same temperature, and we can use a third body, a thermometer, to find this temperature. But we first need to set up a reproducible temperature scale to make this happen. One method is to define zero temperature as the point at which the temperature in a constant volume gas thermometer becomes zero. The second method is to use the triple point of water. This is equivalent to 0.01oC and 32.02oF, and thus we use T3 to help set the freezing point of water. Absolute zero is defined as being equivalent to that of 0 Kelvin, which is -273.15oC and and -459.67oF, and this is a standard that is accepted internationally. It is important to note that the pressure the triple point exists at is 4.58 torr in SI units or .006 atm. To compare, the Earth's average atmospheric pressure is 1 atm. You have observed water existing simultaneously in three states yourself. You voluntarily see it when you add ice to your hot drink of tea, coffee, or chocolate, and then watch the steam rise as the ice melts. You may also see it if you freeze water in an empty soda bottle to create ice, add water, and then generate vapor by blowing into it. The difference is that at the triple point, the total amount of ice, water, and water vapor will not change without a change in temperature and/or pressure. 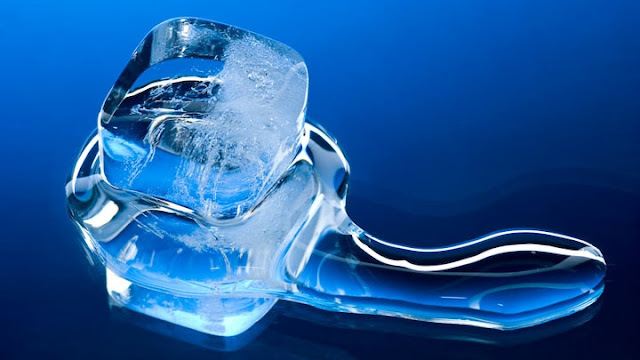 Therefore, on average, the liquid will not freeze or evaporate, the ice will not melt or evaporate, and the water vapor will remain water vapor. In physics and chemistry, the triple point of a substance is the temperature and pressure at which three phases (gas, liquid, and solid) of that substance may coexist in thermodynamic equilibrium. For example, the triple point temperature of mercury is at −38.8344 °C, at a pressure of 0.2 mPa. The triple point of water is used to define the kelvin, the SI base unit of thermodynamic temperature. The number given for the temperature of the triple point of water is an exact definition rather than a measured quantity. The single combination of pressure and temperature at which pure water, pure ice, and pure water vapour can coexist in a stable equilibrium occurs at exactly 273.16 kelvins (0.01 °C) and a pressure of 611.73 pascals (ca. 6.1173 millibars, 0.0060373057 atm). At that point, it is possible to change all of the substance to ice, water, or vapor by making infinitesimally small changes in pressure and temperature. What is the degree of freedom at the triple point of water? The degrees of freedom at triple point of water is 0.we know F=C-P+2.For one component system(i.e;C=1)the formula reduces to F=3-P.Now at triple point of water, three phase i.e;ice water and water vapor are in equilibrium.So P=3.Putting this value in the above reduced equation we get F=0.